Tacos 4 Life - Jackson Tn | CitySpotz Search & Social Inc.
Tacos 4 Life and our customers have the exciting opportunity to help end childhood hunger around the world. The strategy is simple - Tacos4Life will donate the funds necessary to Feed My Starving Children to purchase one meal for every meal sold in the restaurant. Childhood starvation and malnutrition is a devastating problem, claiming more than 6200 children's lives a day around the world. This has to be stopped and we believe we can help save lives through the meal4meal program. For every taco, quesadilla, salad or rice bowl sold, 0.22 is donated to FMSC. They have produced a scientifically developed rice pack designed to meet the needs of severely malnourished children in over 60 countries. They have consistently received the highest grades awarded for accountability and transparency. 92 percent of donations are spent on feeding programs. Tacos 4 Life works with organizations in countries like Honduras, Haiti, Belize, Dominican Republic, and Swaziland where the FMSC meals are used to help feed children in need. Many of the children there face economic and health challenges. The food is used as a foundation to provide medical care, education, and skills training. We have seen the life changing impact the food has made first hand and the hope each meal provides. 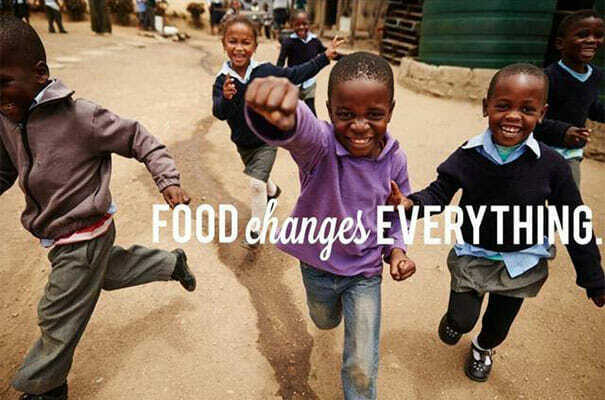 Together we can continue to provide sustainable change to children around the world through food! Click 'Donate Now' to go to Feed My Starving Children's donation page. EAT TACOS. GIVE LIFE TO A HUNGRY CHILD. We believe in fresh, unique, quality food, made for you! Not only can you enjoy delicious fried chicken, chipotle steak or crab cake tacos, for every meal you buy Tacos 4 Life will donate a meal to a hungry child. Come in and eat locally, impact globally!